Sotheby's, New York, 25 June 1992, lot 223. Mikimoto Catalogue, p. 103, no. 296. B. Stevens, The Collector's Book of Snuff Bottles, New York, 1976, no. 862. 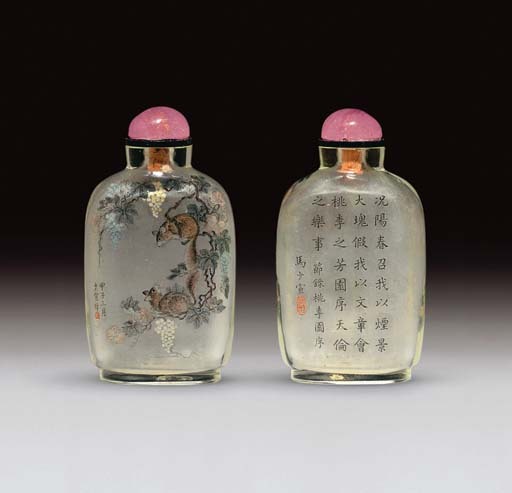 The subject of squirrels and grapes, although a popular one in other media such as coral, amber, jade and molded porcelain snuff bottles from the nineteenth century, is rarely found in inside-painted snuff bottles, and when it is they are usually by Ma Shaoxuan who painted several versions of the subject during his career, usually coupled with calligraphy on the other side. The squirrels and grapes design is essentially the same and each is exquisitely painted in Ma's characteristically naturalistic style, with unusually realistic detail, shading and attention to detail. Of the few recorded examples this is perhaps the most delicately painted and effective version. Three other examples by Ma include one dated to 1896 in the Russell Mullin Collection, one illustrated by R. Kleiner, Chinese Snuff Bottles. The White Wings Collection, p. 273, no. 190, and one from the Ko Collection, dated to the same year as the present bottle, 1897. Another example, but painted with birds on the reverse instead of calligraphy, formerly from the J & J collection, was sold in these rooms, 30 March 2005, lot 38. Now let us assemble here at the fragrant Peach Garden to enjoy each other's company. - Preface to Poems Composed at a Spring Evening Banquet Held at the Peach Garden."